Capturing a single image with a long exposure time T and a low-ISO setting. This image has low noise and high dynamic range (assuming the camera has a 14-bit sensor), but often contains motion blur. We need to remove the blur to obtain the underlying HDR image. Capturing a sequence of images in a burst mode within the same period T. Each image has a short exposure time and a high-ISO setting; consequently, each image is sharp but noisy. We need to remove the noise to recover the HDR images. Multi-frame denoising is a numerically much better conditioned problem than deconvolution within a large range of camera overhead (from 0 to 90%). Camera overhead is the time required to transfer one image from sensor to storage between two consecutive image capture. Denoising multiple high-ISO images reduces read noise more effectively than a single-shot low-ISO imaging, if post-amplifier read noise is not trivially small compared to the pre-amplifier read noise, which is true for popular high-end cameras like Canon 5D and 1D Mark III. Our analysis also suggests, conventional HDR approach that fuses shots with varying exposures is less reliable than multi-frame denoising, because shots with long exposure need to be deblurred. Our theoretical analysis assumes translational motion and spatially-invariant blur. To put our analytical insight to practical use, we demonstrate that existing optical flow and image denoising techniques can be combined for HDR imaging, which enables capturing HDR images for complex scenes with large depth variation using handheld cameras. Such scenes cause spatially-varying motion blur for moving cameras, which poses a serious challenge to existing HDR techniques. 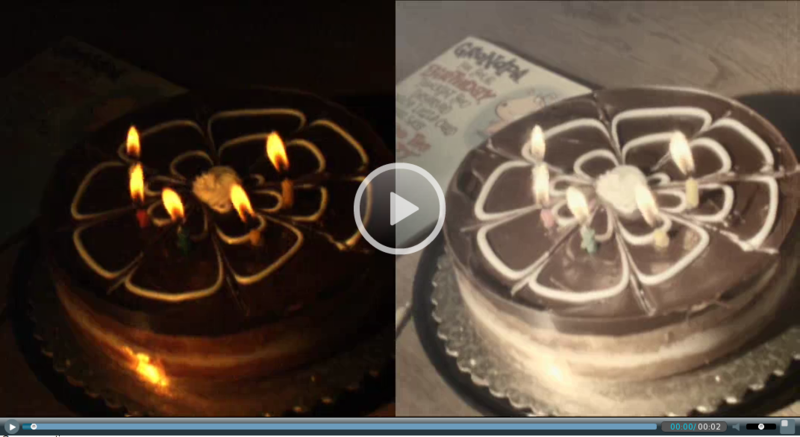 Our HDR images are sharp and clean and the HDR videos have high temporal stability, as the following videos show. Our technique currently is limited to handshake motion and small scene motion; handling highly dynamic scenes, such as a dancing crowd, remains as a future work. This work is supported in part by National Science Foundation EFRI-0937847, IIS-0845916, and IIS-0916441. Download the MOV file (8.5MB). Download the MOV file (14.8MB). The following examples give a more in-depth illustration of our HDR method, in terms of the amount noise in the input, output PSNR, comparision with the state-of-the-art, and the importance of 14-bit sensors for HDR imaging. 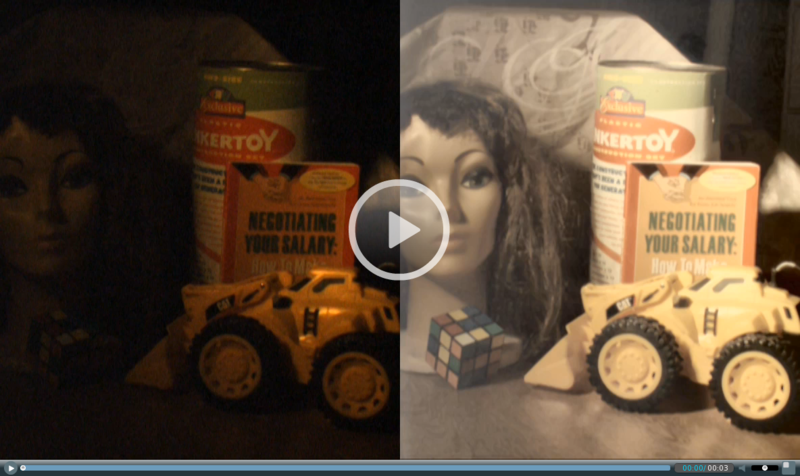 These examples show that HDR images can be generated by denoising multiple moving images captured by a camera with high-resoluton Analog-to-Digital conversion. These examples show that our approach is more effective than the state-of-the-art video denoising algorithm for the purpose of generating HDR images captured by a hand-held moving camera. These results show that having a high-resolution ADC is important for computing HDR images by multi-image denoising. Please read our paper for details of our theoretical analysis. These examples show that multi-image denoising is a much more reliable way for image restoration than single-image deblurring. These examples show how multi-image denoising performace varies as a function of camera overhead -- the time needed to save images from a sensor to its storage.